The State of Israel, our country, is celebrating its 60th anniversary and as Minister of Immigrant Absorption, this is a festive opportunity to send you a personal message: Come Home. The State of Israel is your home. This is where your children should be educated, raised and plant their roots, for their future and to build the future of the State of Israel. You are needed in all walks of Israeli life, to strengthen our ranks, to empower the economy, to enrich the culture, to cultivate leadership for the coming generations, to take an active and creative part in all that happens here, to promote our national and social stability and to become an integral part of Israeli identity and experience. 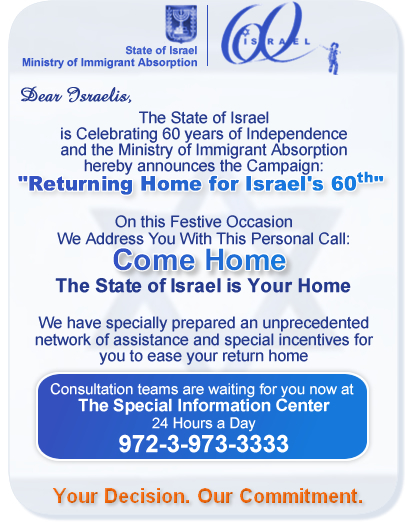 In honor of the State's 60th anniversary the Ministry of Immigrant Absorption has prepared you a special welcome. We have formulated a unique and varied aid program to ease your return home and remove the obstacles from realizing your decision. The Ministry of Immigrant Absorption teams spread across the country will be at your disposal with consultation and individual attention to provide answers to questions concerning employment, entrepreneurship, health, etc. In addition personal consultants will help to plan familial and individual absorption programs adapted to your needs. Your successful integration into Israel is both a professional challenge and a national commitment. This is your opportunity to return home and your chance of becoming part of the next generation that forms the State of Israel, your country.